From violent video games to Twitter to the news, federal officials on Thursday heard conflicting testimony on the effects entertainment could play in the prevalence of school violence — a conversation that was spawned by several mass school shootings this year. 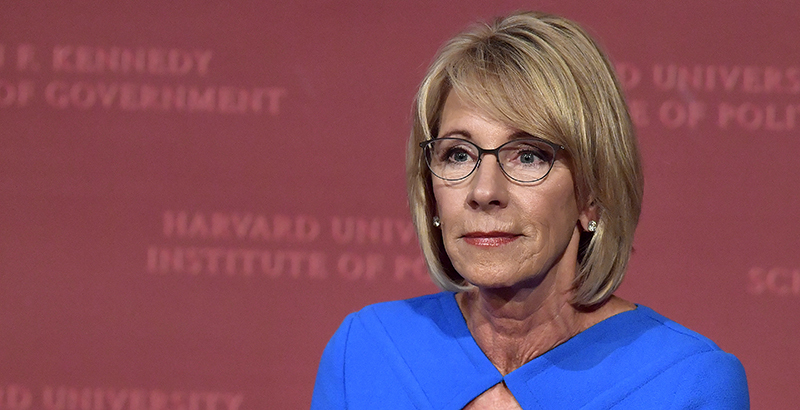 The conversation took place in Washington during a meeting of the Federal Commission on School Safety, a group chaired by Education Secretary Betsy DeVos to explore the causes of, and potential solutions to, school violence. The White House created the commission after the deadly mass school shooting in February at Marjory Stoneman Douglas High School in Parkland, Florida. Conversation topics Thursday were wide-ranging, including the rise of cyberbullying and the “24-hour news cycle.” But the most heated debate centered on the always controversial question of the role violent video games play in promoting real violence — a conversation that frequently follows school shootings. After noting the difficulty of identifying the root causes of violence and predicting future attacks, L. Rowell Huesmann, a professor of psychology and communication studies at the University of Michigan, said people’s behaviors can be influenced by observational learning. From infancy on, he said, humans imitate what they see. But Christopher Ferguson, an associate professor of psychology at Stetson University, offered an alternative narrative. Although researchers studied for years the effects of violent media on a person’s likelihood to act violently, the results are mixed. And in studies finding a positive correlation, the effects are “trivial.” In countries where residents view violent media at higher rates, people aren’t necessarily more likely to engage in real-world violence, he said, and as violent media consumption in the U.S. has grown in recent decades, youth homicides have plummeted. It is common after mass shootings, Ferguson said, for confirmation bias to point toward the existence of a correlation. Attorney General Jeff Sessions, who serves on the commission, asked whether a young person with a predisposition to act violently can be triggered by a violent video game or movie, and again, Huesmann and Ferguson disagreed. While Huesmann said yes, Ferguson pushed back, pointing to a study that found that vulnerable populations are no more influenced by violent media than other children. The commission hearing also focused on the role the news media could play in the frequency of, and concern about, school shootings. Jennifer Johnston, an assistant professor of psychology at Western New Mexico University, highlighted the prevalence of “media contagion,” in which heightened coverage of mass shootings could lead to more violence. In her research, she found that mass school shooters typically share several tendencies: They lack a previous history of violence, they are depressed to the point of becoming suicidal, they are socially isolated, and they are narcissistic and fame-seeking. Given these factors, she said, news outlets should commit to withholding the names and other details of suspected shooters.